37610 + 37402 6C53 0630 Crewe Coal Sidings (Drs) - Sellafield B.N.F. 37194 tnt 37606 6C51 1258 Sellafield B.N.F. - Heysham Harbour P.S. 37194 + 37606 0C52 1605 Heysham Harbour P.S. - Sellafield B.N.F. 66301 + 66421 + 37601 0K27 1559 Carlisle N.Y. - Crewe Bas Hall S.S.M. 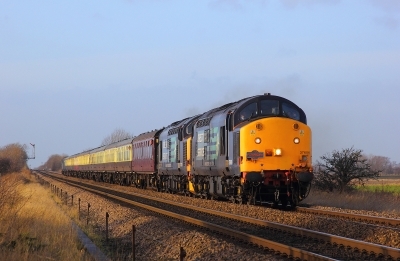 37405 + 20312 0Z35 1045 Carlisle Kingmoor Sdg(Drs) - Carnforth D&U.G.L. 37423 + 37604 6C53 0630 Crewe Coal Sidings (Drs) - Sellafield B.N.F. 1444 Clacton Station Down Reception - Stowmarket D.G.L. 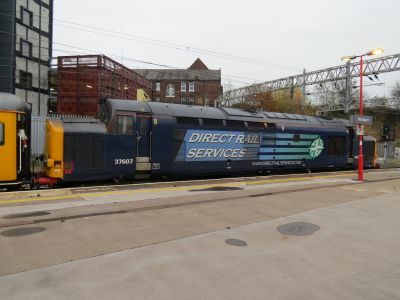 37423 + 37604 6L70 0055 Crewe Coal Sidings (Drs) - Sizewell C.E.G.B. 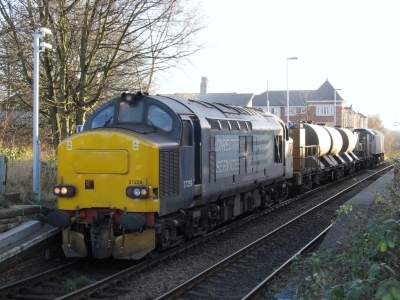 37667 tnt 37603 3Z03 1014 Derby R.T.C. 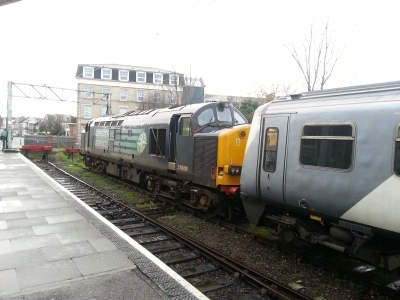 (Network Rail) - Hither Green Down Recp. 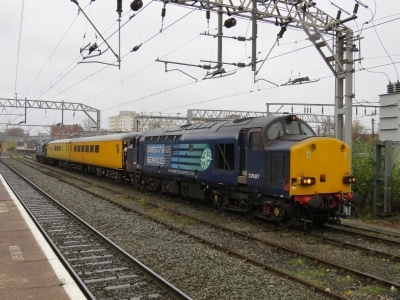 37423 + 37604 tnt 37612 5Z40 1429 Pengam Sidings - Crewe H.S. 37405 + 37194 6C53 0630 Crewe Coal Sidings (Drs) - Sellafield B.N.F. 37609 0Z37 0900 Preston Dock St Sdgs - Stowmarket D.G.L. 37194 + 37405 6V73 0433 Crewe Coal Sidings (Drs) - Berkeley C.E.G.B. 1Q23 2008 Westbury - Old Oak Common H.S.T.D. 37261 + 57003 6L70 0055 Crewe Coal Sidings (Drs) - Sizewell C.E.G.B. 1845 Dollands Moor Sdgs - Old Oak Common H.S.T.D. 37604 + 37423 6C53 0630 Crewe Coal Sidings (Drs) - Sellafield B.N.F. 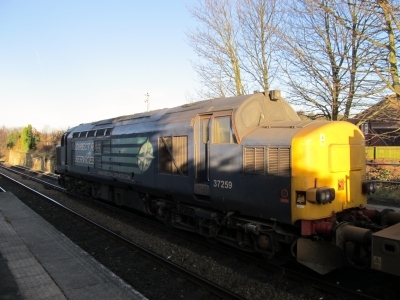 37218 tnt 37607 1Q16 1614 Derby R.T.C. 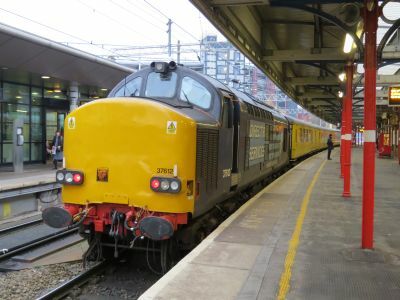 (Network Rail) - London Paddington - Banbury North S.B. - London Marylebone - West Ruislip - London Paddington - Westbury Down T.C. 37261 + 37405 6C53 0630 Crewe Coal Sidings (Drs) - Sellafield B.N.F. 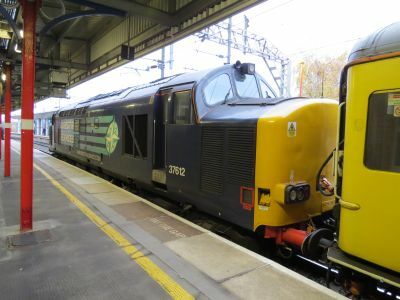 37419 tnt 31465 1Q13 0611 Derby R.T.C. 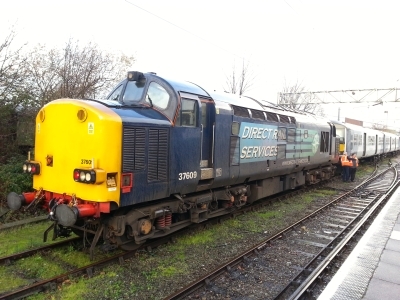 (Network Rail) - Cleethorpes - Doncaster L.I.P. 37423 + 37604 6V73 0433 Crewe Coal Sidings (Drs) - Berkeley C.E.G.B. 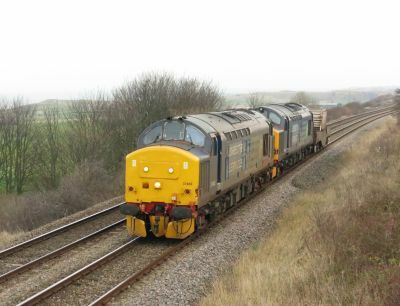 37606 tnt 37688 6C51 1258 Sellafield B.N.F. - Heysham Harbour P.S. 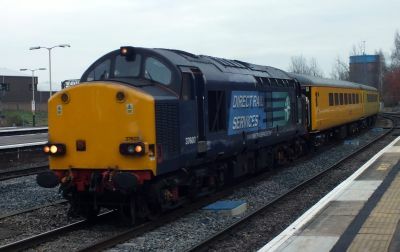 37682 3Z71 0945 Didcot T.C. - East Ham E.M.U.D. 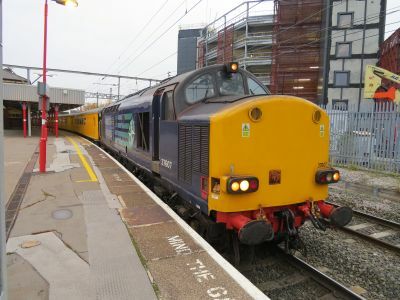 37261 + 37405 6L70 0055 Crewe Coal Sidings (Drs) - Sizewell C.E.G.B. 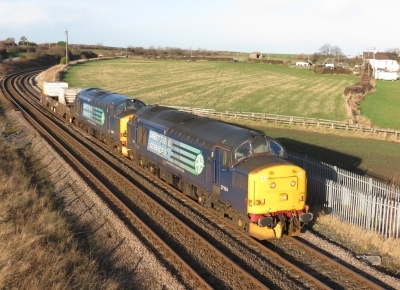 37602 tnt 37605 6S99 0437 Carlisle Kingmoor Sdg(Drs) - Georgemas Junction C.E. 37688 + 37611 6C53 0630 Crewe Coal Sidings (Drs) - Sellafield B.N.F. 37194 + 37419 6V73 0433 Crewe Coal Sidings (Drs) - Berkeley C.E.G.B. 37194 + 37419 6C53 0630 Crewe Coal Sidings (Drs) - Sellafield B.N.F. 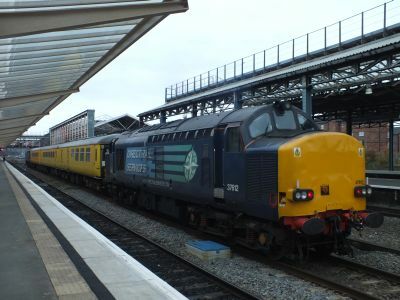 37682 3Q01 0006 Alexandra Dock Jn. T.C. - Swansea Burrows S.S. - Cwmgwrach - Neath - Onllwyn Washery - Jersey Marine Jn South - Alexandra Dock Jn. T.C. 3Q01 21:33 Alexandra Dock Jn. T.C. - Cardiff West -Cwmbargoed - Rhymney - Cardiff West - Old Oak Common C.S. 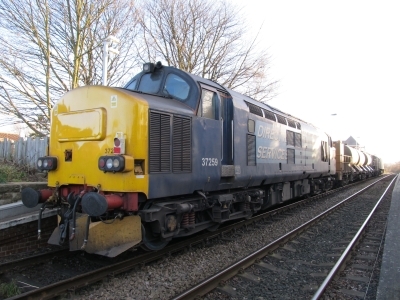 37601 tnt 37606 6C51 1258 Sellafield B.N.F. - Heysham Harbour P.S. 37604 tnt 37609 1Q14 2124 Alexandra Dock Jn. T.C. - Splott Junction - Pengam Jn - Merthyr Tydfil - Pontypridd - Tower Colly - Pontypridd - Alexandra Dock Jn. T.C. 37261 + 37405 6V73 0433 Crewe Coal Sidings (Drs) - Berkeley C.E.G.B. 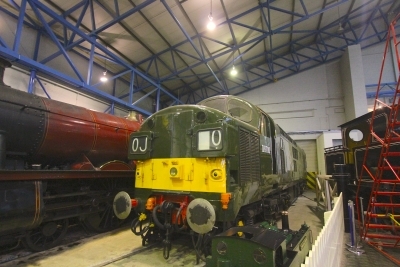 37682 3Z03 1754 Derby R.T.C. (Network Rail) - Alexandra Dock Jn. T.C. 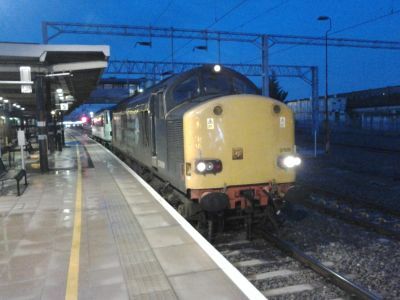 97302 tnt 97303 3S71 Crewe T.M.D. (E) - Wrexham - Crewe T.M.D. (E) ?? 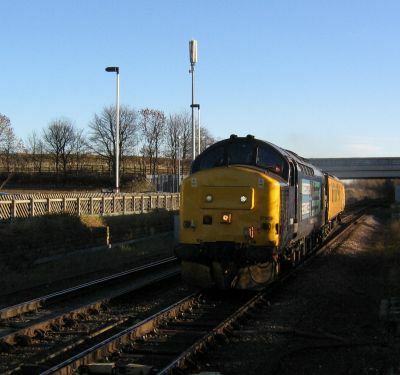 0Z51 1550 Drigg Bnf - Sellafield B.N.F. 37611 + 37688 6L70 0055 Crewe Coal Sidings (Drs) - Sizewell C.E.G.B. 37194 3Q05 2105 Derby R.T.C. 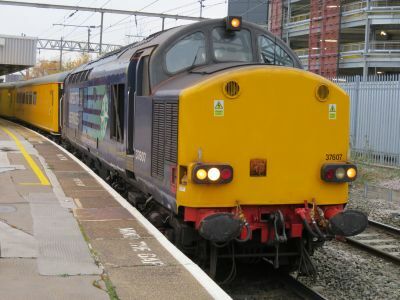 (Network Rail) - Peterborough - Doncaster - Aldwarke Jn - Doncaster L.I.P. 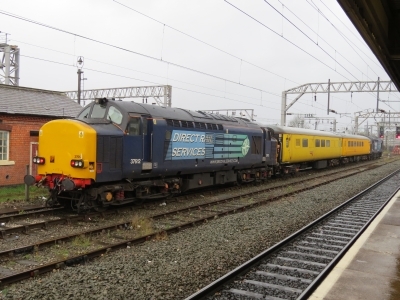 37601 + 37604 6C22 0640 Carlisle Kingmoor Sdg(Drs) - Sellafield B.N.F. 37606 + 37259 6C53 0630 Crewe Coal Sidings (Drs) - Sellafield B.N.F. 37606 tnt 37259 6C51 1258 Sellafield B.N.F. - Heysham Harbour P.S. 97301 3Z03 1020 Exeter Riverside N.Y. - Exeter St Davids Fp - Exeter Riverside N.Y.
37419 tnt 31105 1Q18 0525 Heaton T&R.S.M.D. - Prestonpans - Heaton T&R.S.M.D. 37425 3Q30 1934 Thurso - Inverness T.M.D. 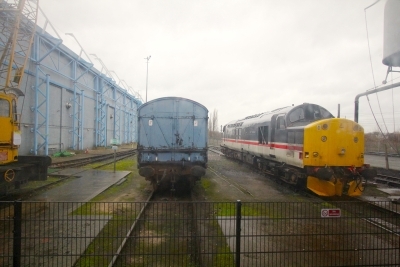 37682 1Q31 0605 Derby R.T.C. - Sinfin Central - Peterborough - Barnetby Down Sidings - Doncaster L.I.P. 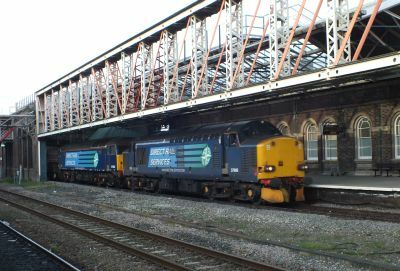 3Q54 2247 Exeter Riverside N.Y. - Lostwithiel - Exeter Riverside N.Y.
37419 tnt 31105 1Q18 0454 Derby R.T.C. 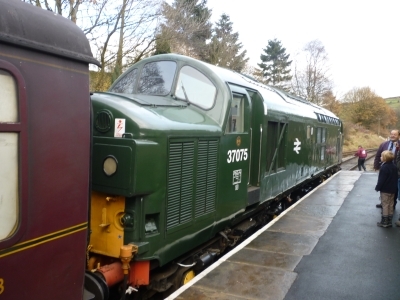 (Network Rail) - Heaton T&R.S.M.D. 37609 + 37259 6V73 0433 Crewe Coal Sidings (Drs) - Berkeley C.E.G.B. 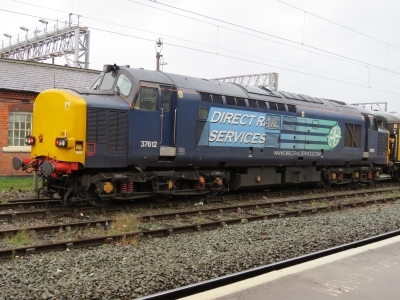 66434 + 37610 0S82 1120 Carlisle Kingmoor Sdg(Drs) - Coatbridge F.L.T. 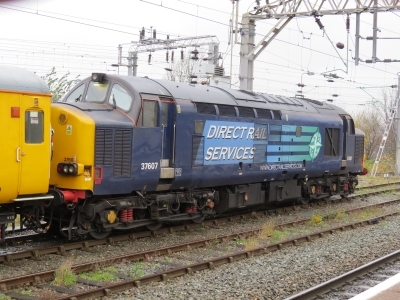 97301 3Z08 1754 Derby R.T.C. - Exeter Riverside N.Y.